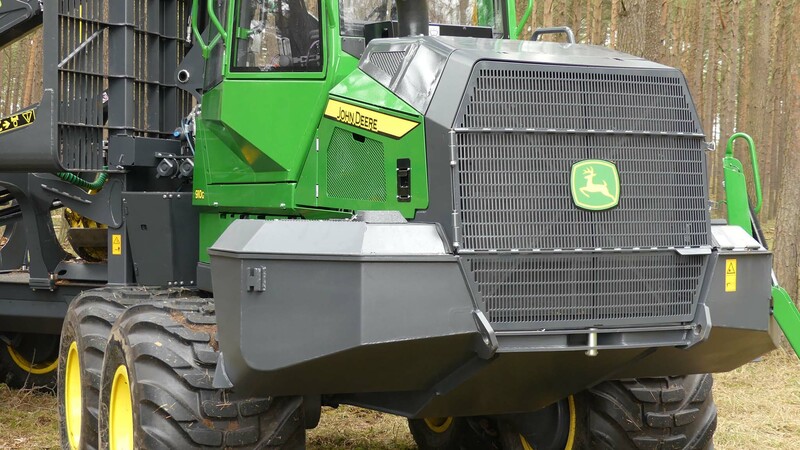 A new small forwarder from John Deere is coming. 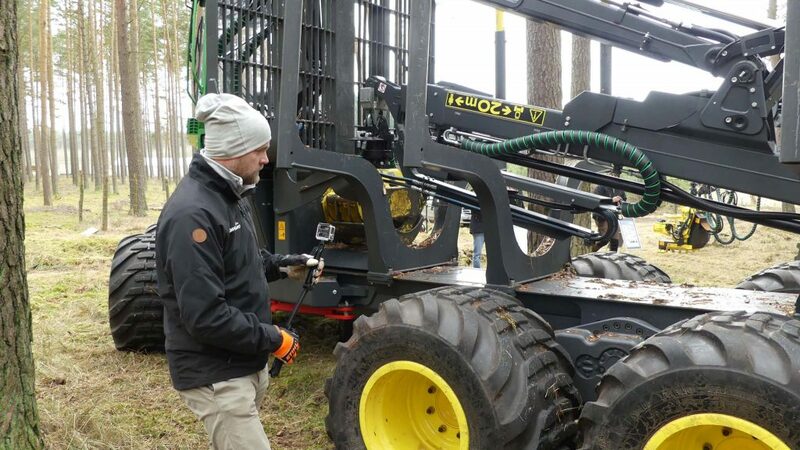 910G is the model name and it will be replacing the trusty 810 in performing thinning projects in the forest. With this, an era comes to an end. Read on to learn why. 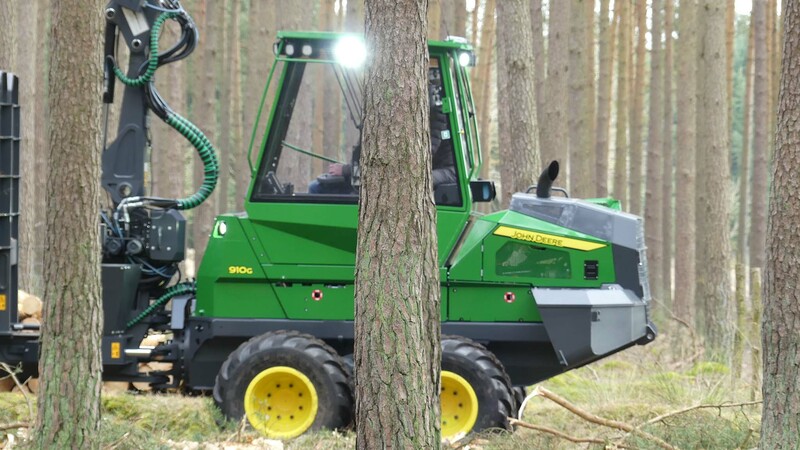 John Deere’s previously smallest forwarder, the 810, has a history as far back as 1978. 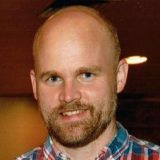 That was when Lars Bruun and partners produced Minibruunetten 578. 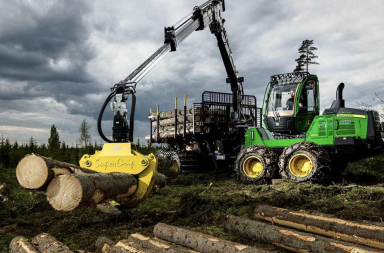 The success of Minibruunetten ensured that it would live on through Bruun System, ÖSA, Rauma-Repola, FMG, Timberjack and John Deere. 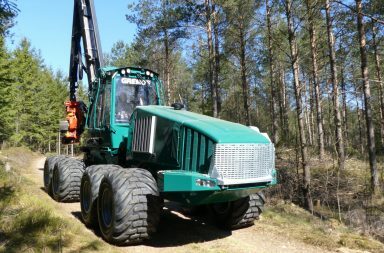 A significant factor was that the crane was mounted on the front chassis of the forwarder. But this era now comes to an end, and 910G now mounts its crane in the bunk area “like everyone else”. There’s no sense in becoming all sentimental, so let’s leave history behind us and focus on the 910G, which comes with a few features that will be interesting to follow. The key term: customization. For starters, the 910G can be delivered with either 22.5” wheels (standard in this segment), or 24.5” wheels. This is definitely a flirt with forestry contractors focusing on thinning in the forest as 22.5” has been a frequent topic of discussion. Comfort and accessibility has been debated as smaller wheels will lower both. 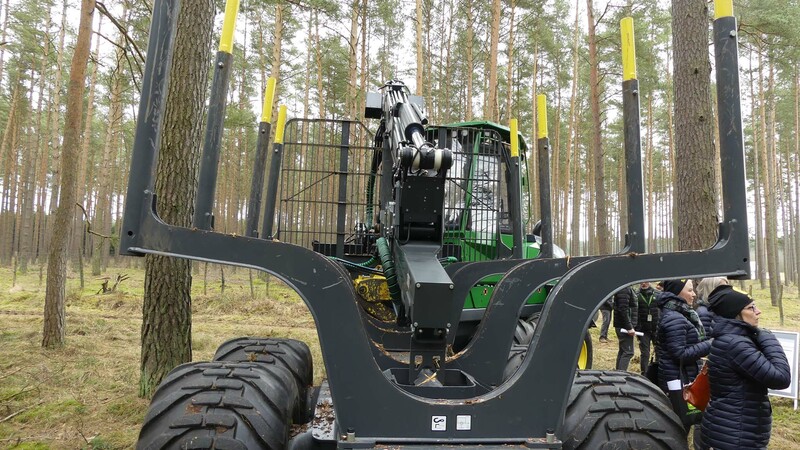 The forwarder can also be manufactured with six wheels, with 34” at the front, but it’s doubtful that this setup will be of interest in the Nordic countries. Another interesting fact is that John Deere are opting for a larger transmission engine in the 910G with 24.5” wheels, increasing power to 150kN with 24.5” wheels compared to 110kN with 22.5” wheels. This means that it’s only with the 24.5” wheels that the 910G can compare to the pulling power of rivals in the same size segment. 910G can be shipped with a CF5 crane (or CF1, which should be considered the standard). 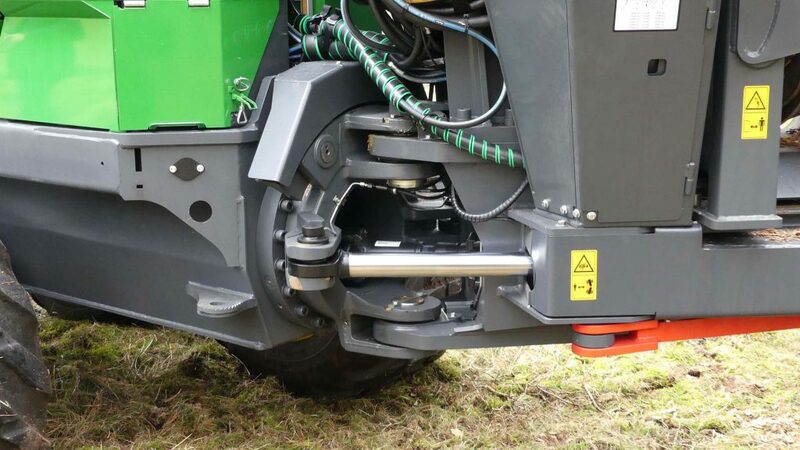 CF5 can be equipped with IBC, the first version of boomtip control from John Deere. This is wonderful news. Now there’s an option for customers who focus in size and flexibility in thinning projects to also use IBC. Each crane comes in three lengths. CF1: 7,2/8,7/9,8 m, and CF5: 7,2/8,5/10 m. The lift torque (gross) is 76 kNm and 102 kNm respectively. An interesting aspect is that the CF1 mostly resembles the crane of the Sampo FR28, and CF5 resembles the cranes of Komatsu 835, Rottne F10D, Eco Log 554D, and to some extent the Gremo 1050f. The engine of the 910G is based on the tried and tested 4045 diesel engine. A straight four-cylinder diesel of 4.5 liters where John Deere proudly skips an emission stage and goes straight to Stage5. This is a good thing as it reduces emissions. Stage5 will be obligatory come 2019. AdBlue/Urea is now the norm, in other words. 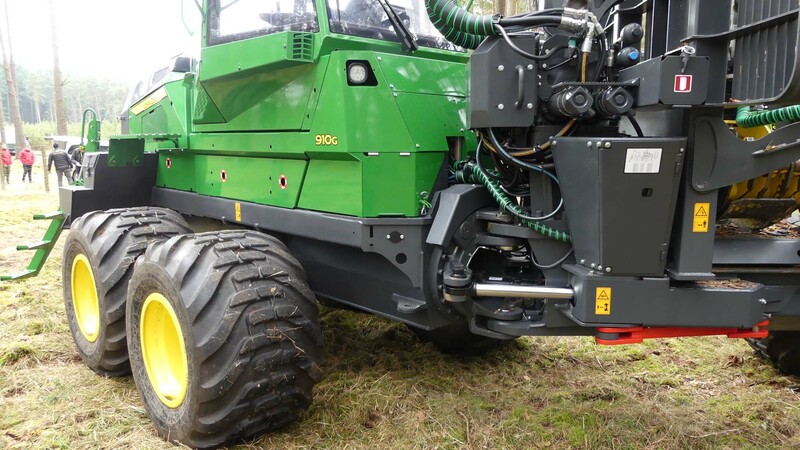 John Deere have also, by their own admission, worked hard on improving visibility and collaborated with BMW to optimize the construction of the engine. The effect has increased by around 15% compared to the 810E, with the 910G delivering 118kW and 650NM. Along with the new gray frame color, the 910G has also received a new loading space or bunk area. Exciting news in this regard is that you can choose regular or narrow width. With regular width the loading area is 4.0m2, and with the narrow option it’s 3.5m2. 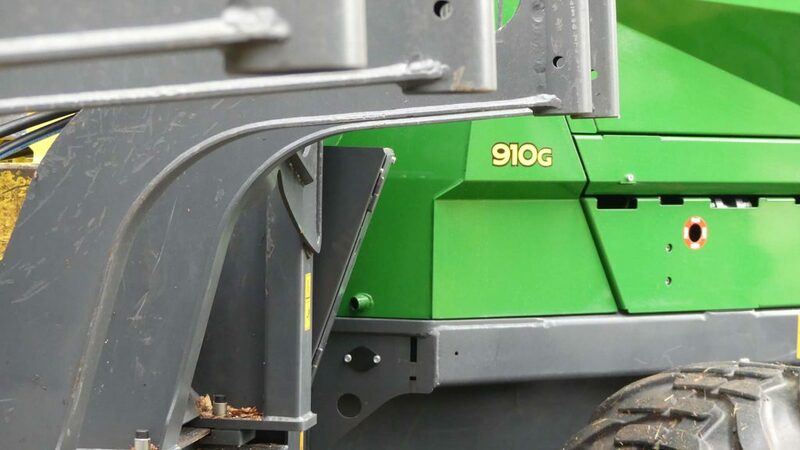 As before in the slightly larger forwarders from John Deere there’s also the opportunity to order 910G with a short frame. The rear axel is then moved 40cm closer to the waist. 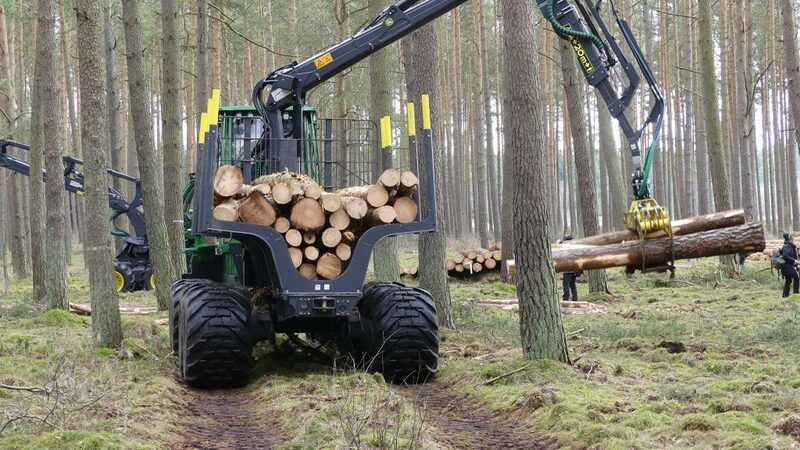 This greatly improves smoothness and flexibility, the downside being load distribution and stress at the waist during average lengths of over (ca) 5 meters, particularly when transporting timber (probably not suitable for final felling with rough timber). Max loading capacity is set to 9 tonnes. 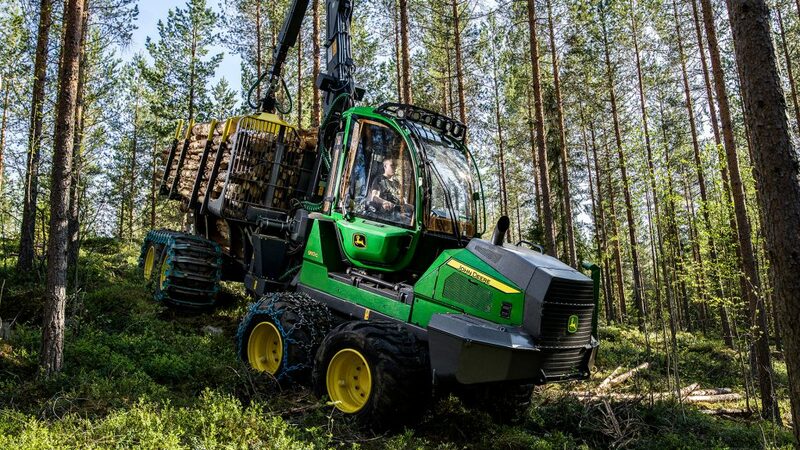 The John Deere 910G comes with either a rotating cabin or a fixed cabin. The rotating cabin is better from an ergonomic point of view, but heavier and costlier. 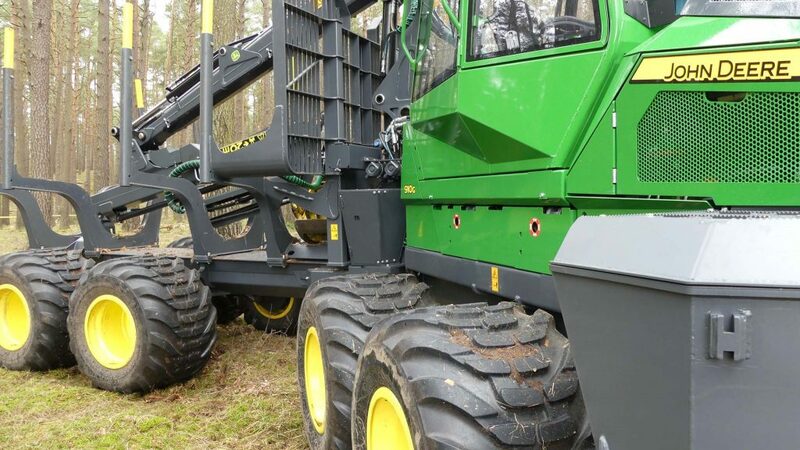 When Forestry.com checked out an early 910G model John Deere had chosen to showcase the forwarder with a fixed cabin. Spontaneously, the fixed cabin feels spacious and nice, but several hours of work in the forest in both cabins would be required to provide a proper test report. It will be highly interesting to follow the 910G onto the market. 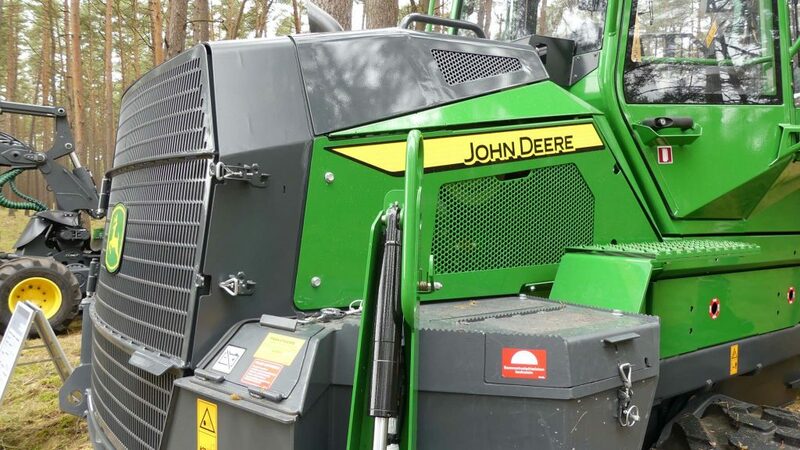 One thing is certain, John Deere offers loads of options to have your forwarder custom made to fit your everyday needs. 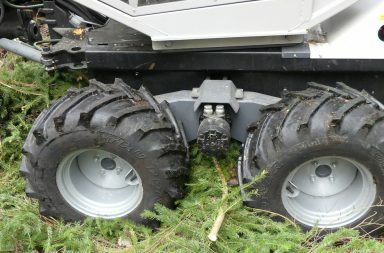 For this reason, we may see various 910G setups in the forests in a few years. Personally, and strictly from a perspective of performing thinning in the forest, I would imagine that a 910G with a fixed cabin, narrow and shortened loading area, 24.5”/600 wheels (8wd) and CF5 with IBC could be a small but effective setup. What do you think? 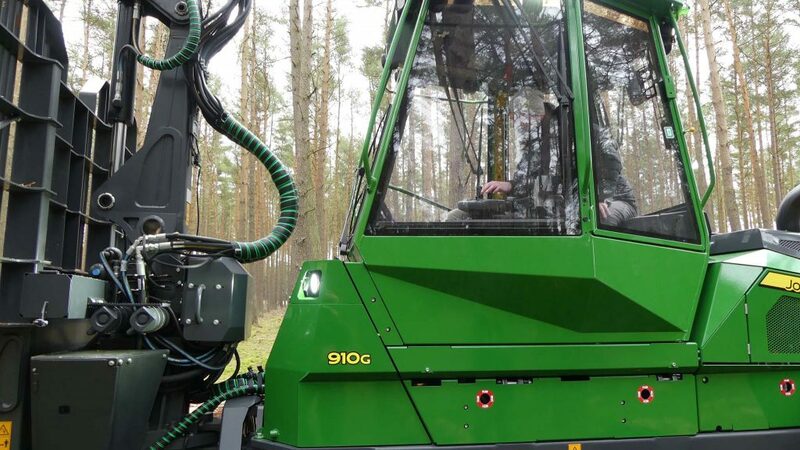 Read about the 910G in Swedish.